To know about the differences between a running shoe and a walking shoe, try to know about all properties of these two shoes. Walking shoes are not perfect for the runners. Runners need the flexible shoes but walking shoes are stiff. A walker can easily use a running shoe but walking shoes are not enough for runners. However, there are some other differences between a running shoe and a walking shoe. 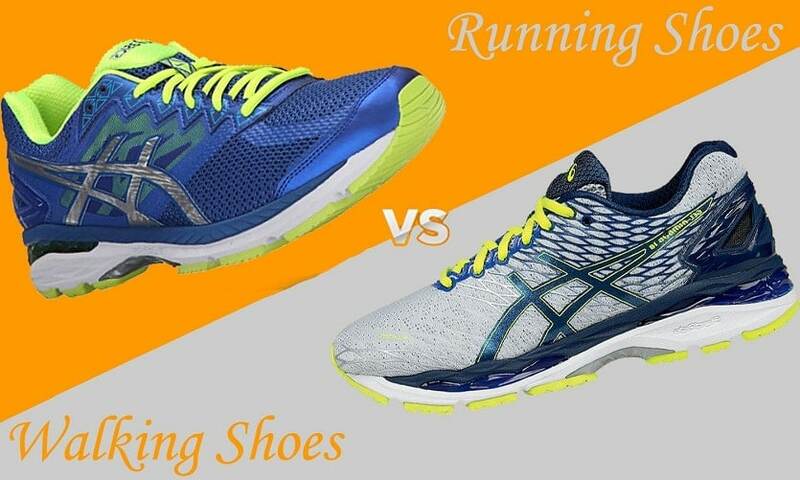 As running shoe and walking shoe are different, they, of course, have some differences. Let’s see them. Runners put the body weight on their feet more times than the walkers. So, they need the shoes that are well cushioning in the heel area and the forefoot area. If you see some running shoes of some brands, you will see that the shoes are well cushioning. On the other hand, walker needs not the shoes so cushioning. Extra cushioning increases the weight of the shoes. A lighter and tight pair of shoe is good for a walker to walk fast. If you want to walk for a long time and for long distance, you need a pair of best walking shoes. When you run, your feet strike the earth with different parts. But when you walk, your feet strike the ground with the heel. So, running shoes are designed as such way that they should provide the best stability, flexibility. Running shoes heels are higher than the walking shoes. Moreover, the heels of running shoes are more flared than the walking shoes because running shoes need extra stability. Both of the shoes need proper flexibility. Some shoes are flexible more in the midfoot area. Some are in the forefoot area. It depends on the needs of users. However, the walking shoes have the flexibility at the forefoot area. But most of the walking shoes are not so flexible. Motion control of the shoes is most important. So, both runner and walker need the shoes with proper motion control with flexibility. The motion control feature keeps the feet in the neutral position. Running shoes are lighter than the walking shoes. The lighter shoes help the runner to run faster. In the market, the running shoes have the great demands. So, the manufacturers offer a variety of models, color, and design of running shoes. Comfort is the main factor. Though you find the differences between a running shoe and a walking shoe, both shoes need flexibility and comfort. When you feel that you need to replace your shoes, you should replace them without any delay. Most of the shoes last for 300 to 500 miles. Besides, buy the shoes that are well-fitted. Running and walking both are good exercises to you and you need to ensure your safety during doing any of these. So, to keep your feet away from injury, choose the best shoes for you considering some matters.